Into week 6. After taking a look at my current training, I have decided to try to break down my runs slightly differently. My doubles have been 10/10km or so, but I will try to split them more 5/15 or even single a 20km more often from now on. 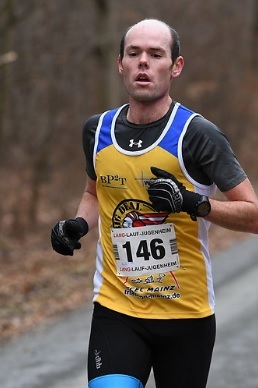 This week will be a bit different as I am racing a 10k in Groß-Gerau on Saturday, my first real form test of the year! PM: I wanted to run 15km after work, but I ended up running 14km, not a big deal I guess, but I misread my watch whilst running! My pace was better, as is normal in the afternoons. I got home a little later than normal, and set off into the cold. I ran my ZDF loop which is 16km long. I have some muscle problems on my right side at the moment, my groin and glutes don’t feel good and I think my knee is being dragged out of line. As soon as I started running it felt fine, which is always a good thing for me! I switched intervals day to Wednesday this week, as I will only do one session, due to my 10k race on Saturday. I had stupidly eaten a packet of figs in the afternoon and was about to pay for it! I ran to Willy Wacker and no one was there, so I started the intervals. 4x1200m in 4:06 was the goal, VO2max work. After 600m in 2:02 I was in trouble, the figs weren’t sitting well! I stopped hoping that I could do a 8x600m instead of a 4x1200m. I set off on the 2nd interval and had to stop after 300m, bugger! So I jogged off to find a toilet, and came back a bit more comfortable and did my 4x1200m in 4:02-3 with 3 minutes rest. I felt pretty good and could have probably done another, but the workout was done, so I was off home. I finished after 15km in 4:31/km average and a 139bpm average. AM: Ran a short route to work. Today and tomorrow will be easy short doubles to recover before my 10k on Saturday. My glutes are still a bit sore when I sit, but the groin feels much better. AM: 5k to work, a bit faster (4:56/km) than some of my recent pre-work runs, that is because I am feeling a bit less stiff nowadays, I feel like I am getting a grip of the mileage a bit more now. PM: I ran up a decent hill on the way home. It is my longer route that I have used to work recently, but in the other direction. It was a fun route, quite steep at times. It was 9.2km total, so 14km on the day. A bit later I went for a swim. I swam for 1h and apparently got in about 2700m, though plenty was with flippers. It really wasn’t too bad. I reckon that I’ll be flying when I really hit the swim training in April! I was a bit tired and my glutes and feet a bit sore, but I set off on an easy longer run. I knew that 29km would get me to my goal of 120km for the week. I thought the route through Nieder-Olm and Zornheim would be about 30, but it was actually 25km, so I added a little loop on to get to 26.2km when I decided that that was good enough, so called it a week. One good set of VO2max intervals, 117km total distance, a new 10k PB with a negative split – I can’t complain! I have decided to run my half marathon as a hard long run next week. My plan is 7km warm up, half marathon in 1:25, then 7km after the race for 35km total. Lets see how the rest of the week fits together, Monday is Rosenmontag, so will be my rest day. Wednesday is my birthday! So Thursday will definitely be a workout, maybe Tuesday too, not sure yet.